After ​you ​have ​obtained ​the ​plugin ​.zip ​file ​(the ​filename ​should ​be ​woocommerce-izettle.zip) you ​have ​to ​upload ​and ​activate ​the ​plugin ​in ​your ​WordPress ​admin ​area. Press ​“Add ​New” ​in ​the ​top ​left ​corner. Press ​“Choose ​File”, ​and ​select ​the ​plugin ​zip ​file ​that ​you ​have ​obtained. Press ​“Install ​Now” ​and ​the ​installation ​will ​begin. When ​the ​installation ​is ​complete, ​press ​the ​“Activate” ​button ​on ​the ​plugin. After ​your ​purchase, ​you ​will ​receive ​an ​e-mail ​with ​the ​license ​key. The ​next ​step ​is ​to ​connect ​your ​WordPress ​site ​to ​the ​iZettle ​API. ​This ​is ​done ​from ​the plugin ​settings ​page. The ​plugin ​must ​always ​have ​a ​valid ​connection ​to ​the ​iZettle ​API. ​You ​can ​view ​the ​current connection ​status ​in ​the ​plugin ​settings ​page. When ​you ​first ​install ​the ​plugin ​and ​press ​the ​“Connect ​to ​iZettle” ​button, ​a ​new ​tab ​opens ​in your ​browser ​asking ​you ​to ​either ​sign ​into ​your ​iZettle ​account, ​or ​if ​you ​are ​already ​signed in, ​to ​approve ​the ​permissions ​that ​the ​integration ​needs. When ​you ​approve ​the ​integration, ​an access ​token ​is ​retrieved ​and ​saved ​to ​your ​WordPress site. ​This ​access ​token ​is ​used ​for ​all ​further ​communication ​with ​iZettle, ​until ​it ​expires, which ​is ​usually ​two ​hours ​after ​the ​access ​token ​was ​retrieved. ​The ​plugin ​will automatically ​request ​a ​new ​access ​token ​if ​the ​previous ​one ​has ​expired. The ​plugin ​settings ​page ​is ​located ​in ​the ​left ​menu ​under WooCommerce - iZettle. The ​settings ​page ​is ​structured ​as ​different ​tabs, ​where ​you ​define ​how ​each ​part ​of ​the plugin ​works. The ​plugin ​has ​several features ​that ​you ​can ​enable ​and ​disable ​at ​your ​will. ​You ​can, ​for example, ​choose ​to ​only ​sync ​product ​stock ​just ​before ​viewing ​a ​product ​with ​the ​Inventory module, ​or ​go ​all ​in ​and ​let ​the ​plugins ​scheduler ​sync ​the ​inventory ​in ​the ​background ​if ​you enable ​the ​“Cron ​/ ​interval ​fetching” ​module. 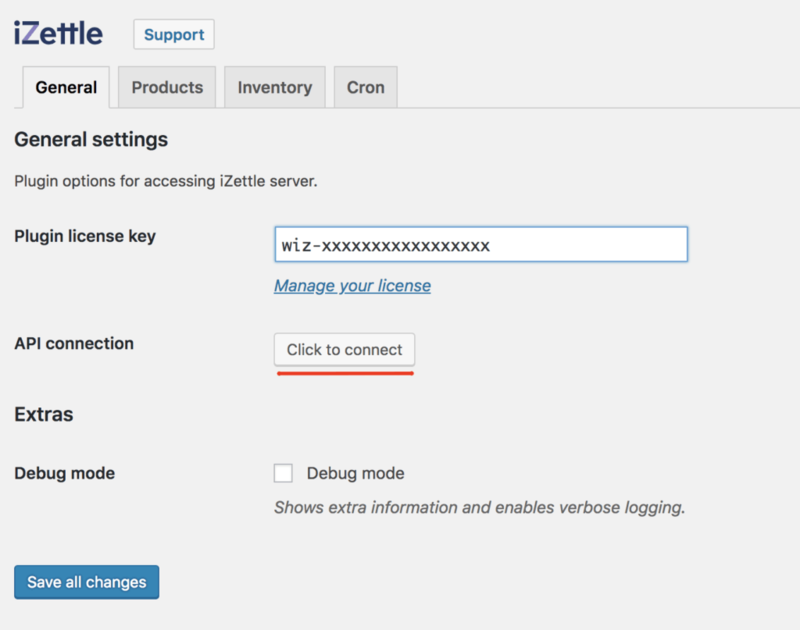 The ​first ​section ​under ​the ​general ​tab ​is ​where ​you ​enter ​your ​plugin ​license ​key, ​and connect ​to ​iZettle. If ​both ​the ​license ​key ​field ​and ​the ​iZettle ​API ​connection ​button ​is ​green, ​your ​site ​is connected ​and ​you ​are ​ready ​to ​use ​the ​integration. To login press the "Click to connect"-button. Now you will be redirected to iZettles login page for third party integrations. Login to your iZettle account with your iZettle-credentials. After login you will be prompted with the permissions to give to plugin. 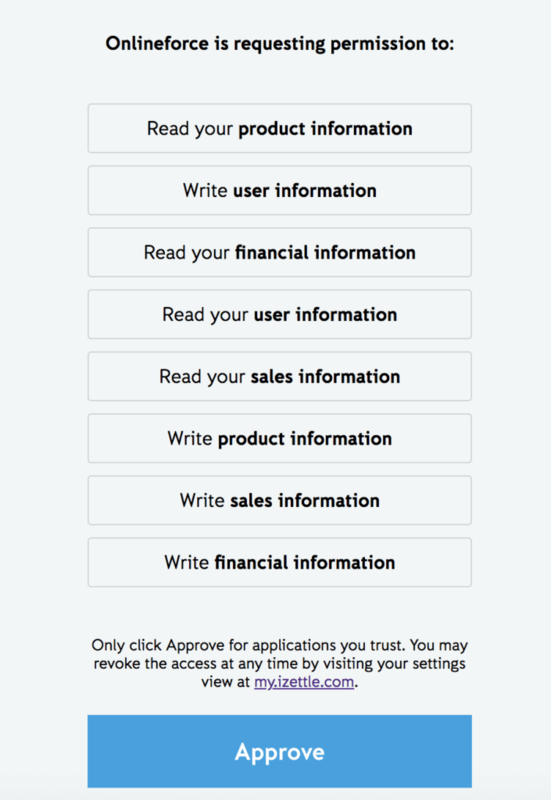 Press "Approve"
Now you will be redirected to iZettle plugin settings again. Do not press "Save" as this will clear all authorization data. We ​understand ​that ​this ​is ​a ​tedious ​process, ​but ​you ​can ​do ​the ​same ​thing ​from ​the plugin settings ​page ​under ​the “Products” ​tab. 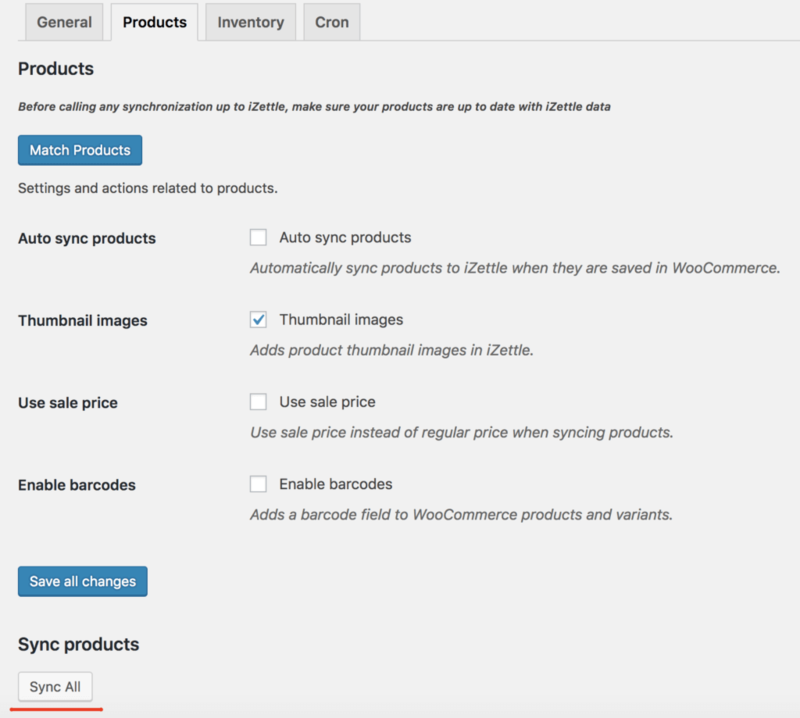 ​You ​can ​trigger ​a ​bulk-sync ​of ​all ​your WooCommerce ​product ​to ​iZettle ​by ​pressing “Sync ​all ​WooCommerce ​products ​to ​iZettle”. Here, ​you ​can ​see ​the ​current ​sync ​status ​for ​each ​product, ​and ​you ​can ​manually sync ​or update each ​product ​to ​iZettle. You ​can ​also ​enable ​auto ​syncing ​of ​products. ​If ​this ​option ​is ​enabled, ​the ​plugin ​will automatically ​sync ​a ​product ​to ​iZettle ​as ​soon ​as ​it ​is ​saved ​in ​WooCommerce. ​Only products ​/ ​variants ​that ​have ​been ​synced ​previously ​will ​be ​automatically ​synced ​when saved. The ​plugin ​is ​able ​to ​keep ​your ​WooCommerce ​and ​iZettle ​products ​stock ​levels ​in ​sync. You ​can ​choose ​to ​pull ​inventory ​from ​iZettle, ​push ​inventory ​to ​iZettle, ​or ​both. To ​be ​able ​to ​use ​the ​inventory ​module, ​you ​first ​have ​to ​enable ​it ​from ​the ​plugin ​settings page ​under ​the ​“General” ​tab. ​Simply ​check ​the ​“Inventory” ​checkbox ​under ​modules. If ​“Pull ​inventory” ​is ​enabled, ​a ​products ​stock ​quantity ​will ​be ​fetched ​from ​iZettle ​every ​time the ​product ​is ​added ​to ​a ​customers ​cart. ​The ​stock ​level ​will ​also ​be ​fetched ​from ​iZettle when ​an ​admin ​views ​the ​product ​in ​wp-admin. If ​“Push ​inventory” ​is ​enabled, ​a ​products ​stock ​quantity ​will ​be ​pushed ​to ​iZettle ​as ​soon ​as it ​changes ​in ​WooCommerce. ​This ​can ​be ​when ​a ​product ​is ​ordered ​or ​when ​you ​manually increase ​the ​stock ​level ​from ​the ​products ​edit ​page, ​or ​when ​a ​product ​is ​refunded. ​It ​can even ​be ​triggered ​from ​other ​plugins ​that ​manipulate ​WooCommerce ​product ​stock.